Palestine Introduction (E) - 7. London I (1921). All previous overprints for Palestine were produced locally by the printing shop of the Greek Orthodox Convent in Jerusalem. In the summer of 1921 it was decided to move the entire production to London. 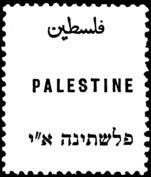 The Stamping Department, Board Of Inland Revenue at Somerset House, London now also made the overprints for Palestine. Previously it had only provided the base stamps in type T3. On the other hand, the overprints specific to Transjordan were still made in Jerusalem, but with additional, often hand stamped, overprints (some made in Amman). Naturally a totally new overprint block (clichée) had to be produced (T7). For the second, English line it uses a Helvetica-type font without serifs instead of the Roman-type font with serifs used by the Jerusalem overprints. The lenth of the individual lines also changes. The design of the printing sheet with two panes of 120 stamps (12x10), intersecting gutters in type A, Jubilee Lines and guide dots remained unchanged, as was the type of paper and watermark. The sheets are now uniformly comb-perforated K15:14. The Rough Perforation known from previous issues is common to all values. Additionally six various perforation errors are known for the 1p stamp. Apart from already known varieties there is one very striking new variant: a clear circle between the A and L in the Arab word al-ujrah (3m only). new plate variety "circle" (3m). The overprint itself can be discerned into a total of twelve types. Of the numerous varieties two (both in the Hebrew line) are easily detected: broken L (lamed) in type 3 and a defective SH (shin) in type 11. Besides these a double overprint is known for the 5p. The specific characteristic of this issue (especially to delimitate it from the Waterlow stamps London II) is -- apart from changes to colour, watermark and perforation -- the elongated and clear inverted commas (dashes) in the third, Hebrew line. The stamps were issued, according to demand, between September and October (some sources list December) 1921. Definitive first days are therefore not known, but days of first known use have been detected by analysing cancellation dates. The circulation figures (print-runs) are taken from Bale. SG no. 61 and SG no. 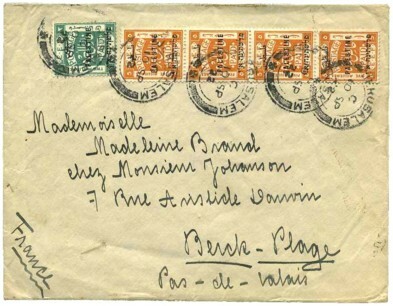 64 in strip of four on letter from Jerusalem to France: JERUSALEM / C / 10 SP / 22. Total 22m was correct for a foreign letter upto 40g.